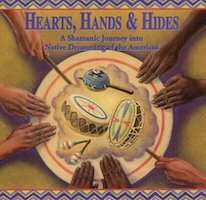 “Hearts, Hands & Hides: A Shamanic Journey into Native Drumming of the Americas.” Peter “Wyoming” BENDER: Night Before Sundance; Crow Dog’s Paradise. MESA MUSIC CONSORT: Drums of the Heart; Invoking the Hawk’s Spirit. Marilyn RIFE with Alice GOMEZ: Legends; Flute Song. NATIVE FLUTE ENSEMBLE: Drummer’s Journey; Drum Quest. Eric CASILLAS: Ya-Ta-Hey; Road Opener. Talking Taco TTCD132A (1 CD) (No website). Found as new in a dumpster on Grammy night (Jan. 28). A sampler; the performers are well represented on Talking Taco. If a scholarly take exists in this area, Hearts won’t qualify. Notes are skimpy, and these tracks mandate no great alteration in listening habits (the first cut has synthesizer fills). Still, it’s like a cable series that improves at midpoint. Good sound throughout. The bird cries were either dubbed in or carefully rehearsed. Two outfits will merit my investigation (what a sampler hopes for). The sole insinuating piece is the finale, Native Flute Ensemble’s Drum Quest — its beats move in steps, and rattles are prominent. Drummer’s Journey also proceeds more softly and subtly than the norm. Ya-Ta-Hey (Eric Casillas) brings metallic percussion and a declamatory vibe — at 6:44 the longest track, which the changing textures and a voice that murmurs along or exhorts fully justify. Another dumpster disc, Mishka Shubaly’s How to Make a Bad Situation Worse, is still rewarding a decade later, for the unsparing honesty and scabrous wit. “Cantante e tranquillo.” Ludwig van BEETHOVEN: String Quartet No. 16, Op. 135: Lento assai, cantante e tranquillo (1826). György LIGETI: String Quartet No. 2: Allegro con delicatezza – stets sehr mild (1968). Johann Sebastian BACH: Die Kunst der Fuge, BWV 1080: Contrapunctus I (1745-50). György KURTÁG: Aus der Ferne V (1999). Alfred SCHNITTKE: Piano Quintet: Moderato pastorale (1972-76)*. Alexander KNAIFEL: In Air Clear and Unseen: An Autumn Evening (1994). Johann Sebastian BACH: Die Kunst der Fuge, BWV 1080: Contrapunctus XIV (1745-50). György KURTÁG: Officium breve in memoriam Andreæ Szervánszky, Op. 28: Arioso Interrotto (di Endre Szervánszky), Larghetto (1988-89). Ludwig van BEETHOVEN: String Quartet No. 13, Op. 130: Cavatina. Adagio molto espressivo (1825-26). György KURTÁG: Flowers We Are – for Miyako (1973); Hommage à Bach; Ligatura Y (1998); Ligatura for two violins (1989). Ludwig van BEETHOVEN: String Quartet No. 16, Op. 135: Lento assai, cantante e tranquillo (1826). Keller Quartett: András Keller, János Pilz / Zsófia Környei (vln), Zoltán Gál (vla), Ottó Kertész / Judit Szabó (vlc), Alexei Lubimov* (pno). ECM New Series 2324 (1 CD) (http://www.ecmrecords.com/). Acquired via trade at Amoeba (Hollywood, CA). I was keen on slow music long before “age and incapacity” could be blamed, so this 2015 item should have reached its target. Alas, I employ it as a sampler / marketing tool — far from what ECM likely had in mind. The phantom in the room is Bartók, who stays MIA. 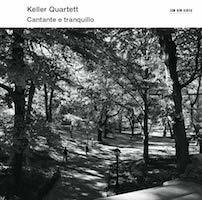 (The group did the six quartets, and Keller / Pilz played the 44 Duos.) I see Die Kunst der Fuge as a keyboard work; the image of J.S.B. working it out alone with the Creator is tough to shake. With Anton Batagov in the mix (SoLyd SLR 0001/2), old-fashioned it isn’t. Goebel / MAK boasts a sizeable cast, and a string contingent sounding more viol consort than string quartet. (Fine by me.) In Beethoven, the Hagen Quartett has pressed a modernist slant for years, and is nonpareil technically. Cantante scores highest for new recordings of Kurtág: The Keller commands that idiom like nobody else, and lack of context is hardly an issue with durations of two minutes or less. Sennheiser HD 800 headphones (original model).